The Laboratory for Embodied Computation is a simple but futuristic building hosting research on the future of buildings. Just as biologists use an electron microscope to study organisms, architects will use our structure to study buildings and construction systems. Commissioned by Princeton University, the Laboratory for Embodied Computation is a simple but futuristic building hosting research on the future of buildings. Just as biologists use an electron microscope to study organisms, architects will use our structure to study buildings and construction systems. 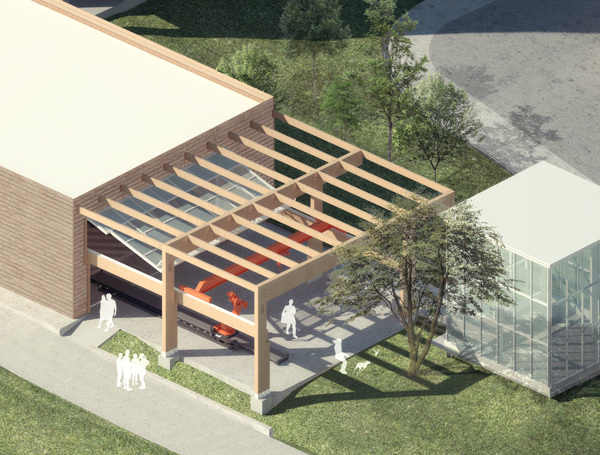 The building will be a model for new sustainability and low-carbon features, including extremely low embodied energy through a unique structure and envelope made of local timber.